Communications and knowledge management are essential activities to help the CGIAR Research Program on Climate Change, Agriculture and Food Security (CCAFS) achieve its development outcomes. Strategic and complementary communication helps highlight success stories, support a change in behaviour in next-users while expanding the program’s reach. This in turn will help Flagships and regions follow impact pathways and reach outcomes. 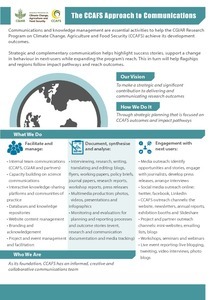 This is CCAFS Program Approach to Communication. CCAFS. The CCAFS approach to communications. 2014. Copenhagen, Denmark: CGIAR Research Program on Climate Change, Agriculture and Food Security (CCAFS).